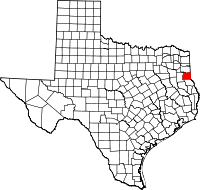 Panola County is a county located in the U.S. state of Texas. As of the 2010 census, its population was 23,796. The county seat is Carthage. Located in East Texas, the name of the county is derived from a Choctaw word for cotton. The Sammy Brown Library in Carthage serves patrons throughout Panola County. The Panola Watchman newspaper was first published in 1873 in Carthage by Tom M. Bowers (1837-1916), a Confederate veteran who earlier printed the Carthage Banner. Until 2013, Panola County was one of about 30 entirely dry counties in Texas, which means that the sale of alcohol was restricted or prohibited. In 2013, local options for alcohol sales were added to the November election ballots and passed, permitting the sale of beer and wine in stores and the sale of mixed beverages at restaurants. Panola County was formed in 1846 from sections of Harrison and Shelby Counties. It was named after a Choctaw/Chickasaw word for cotton. According to the U.S. Census Bureau, the county has a total area of 821 square miles (2,130 km2), of which 802 square miles (2,080 km2) is land and 20 square miles (52 km2) (2.4%) is covered by water. The TTC-69 component (recommended preferred) of the once-planned Trans-Texas Corridor went through Panola County. As of the census of 2000, 22,756 people, 8,821 households, and 6,395 families resided in the county. The population density was 28 people per square mile (11/km²). The 10,524 housing units averaged 13 per square mile (5/km²). The racial makeup of the county was 78.78% White, 17.67% Black or African American, 0.36% Native American, 0.24% Asian, 1.87% from other races, and 1.07% from two or more races. About 3.5% of the population were Hispanic or Latino of any race. Of the 8,821 households, 32.00% had children under the age of 18 living with them, 57.90% were married couples living together, 11.30% had a female householder with no husband present, and 27.50% were not families; 25.10% of all households were made up of individuals and 12.80% had someone living alone who was 65 years of age or older. The average household size was 2.53 and the average family size was 3.02. In the county, the population was distributed as 25.20% under the age of 18, 9.20% from 18 to 24, 25.10% from 25 to 44, 24.60% from 45 to 64, and 15.80% who were 65 years of age or older. The median age was 39 years. For every 100 females, there were 92.30 males. For every 100 females age 18 and over, there were 87.10 males. The median income for a household in the county was $31,909, and for a family was $37,595. Males had a median income of $31,333 versus $19,017 for females. The per capita income for the county was $15,439. About 11.60% of families and 14.10% of the population were below the poverty line, including 16.50% of those under age 18 and 16.10% of those age 65 or over. Panola College, a junior college, has operated in Carthage since 1947. Jonathon Anderson, dedicated Memorial on the Carthage, Tx square. Founder of Panola County & notable resident, the Anderson family continues on his legacy within Panola County. Texas Country Music Hall of Fame and Tex Ritter Museum is located in Carthage. ^ "TABC Home Page". www.tabc.state.tx.us. Retrieved 2018-07-28.